Please tell me someone is already putting the images together into a big map? Well, I found a secret lair. The "starship" takes forever to navigate, but it's worth it when you find Vader. Also, has anyone else gotten inside of the Washington Monument? There seems to be an opening on the right side near the top, that goes all the way down to the visible line of bricks. Not sure why it's there. 154 coins in 3014 seconds, quite a fun journey! I already know I missed the volcano lair, but I had fun with those huge ships to navigate. I have no idea when I'm going to have time to explore this thing.. wow. I quit at 111 coins in 2350 seconds. 166 coins in 3575 seconds. This is totally amazing. I need a map. I could not help but look inside the source code to find out how many coins there are and I had to smile a big smile when I saw the message that will be displayed when you have found all the coins. Now I'll have to go find them all so I can proclaim “Yes, indeed I am!”. Ideas sleep furiously. wrote: Well, I found a secret lair. But how do you escape it? 88 coins in 1692 seconds, but only because I really have to get out of here. Why is this kind of thing so enthralling? Hell if I know, I just closed the window at that point. There's some dark stuff that's accessible left of the volcano, as in the flat part is a little less black than the other stuff and you fall through it. I think what I found sums it up perfectly. There are a total of 169 coins, and if you collect all of them, it says "Are you gandalf?" Last edited by Aarilight on Wed Nov 25, 2015 6:15 am UTC, edited 1 time in total. How many coins do I need to unlock Nathan Fillion? Thanks, I was sure there was something there, but I was just getting stuck so I gave up, but with your picture, I tried again and found it. 161 coins after exploring the star destroyer and finding the volcano lair. I'm sure I've missed something, but no idea where. So, from all your comments, i assume y'all are seeing more than a black square with a yellow dot? Gandalfx wrote: I could not help but look inside the source code to find out how many coins there are and I had to smile a big smile when I saw the message that will be displayed when you have found all the coins. Now I'll have to go find them all so I can proclaim “Yes, indeed I am!”. 169 coins based on my reading of the source. I wasn't expecting to get them all, but I'm bummed that I was only 3 shy. ShadedKnight wrote: 154 coins in 3014 seconds, quite a fun journey! I already know I missed the volcano lair, but I had fun with those huge ships to navigate. either 153, 159 or 163 coins in 4043 seconds. I looked at the number for a split sec, tried to screen shot and it vanished And now I'm doubting my own memory of the number! The game needs a visible counter. Out of interest, where in the source does it say 169? I was able to find two different maps, but when I try to include the links it doesn't let me post. It's low res and hard to zoom. I'll make those improvements when I have more time. Anyhow, these seem to be all the images; I tried getting greater/smaller coordinates but all give 404s. I may be wrong though. I you just want to explore, and not play the game, then there are three values you should set. Set "window.noclip=1" to enable going through everything. set "window.mewtwo=1" to disable gravity. set "window.i.am.gandalf=1" to make the character jump higher, travel faster, and get a hat. Last edited by EaSea on Wed Nov 25, 2015 4:10 am UTC, edited 1 time in total. speising wrote: So, from all your comments, i assume y'all are seeing more than a black square with a yellow dot? Well I can see the game area perfectly fine on both Firefox and Chrome on my Android, but controlling it is a real pain. It works on Chrome for Mac, too, sort of, with 'a' and 'd' for directions, slowly, and 'k' for jumping/hovering. Crap, I'm supposed to help clean and prep for Thanksgiving! This image is loaded from my server, so it does not put pressure on XKCD servers as Vervious map does. The whole map is originally 182 tiles horizontal and 46 tiles high, while one tile is 513 by 513 pixels. That makes the map 93366 by 23598 pixels or 2203 megapixels big! My map is roughly 1/10th the size so normal computers can still handle it. In my map you can see truly empty spaces by the broken link icons, so no, in these areas is nothing small hidden. Whatever this is, it doesn't seem to work on Safari. 140 coins in 2889 seconds. "Undefined" for the message though. All I wanted was a quick comic to read at work while I waited for an application to start! 166 coins and I missed the time but I've been playing this on and off all day at work haha. Maddening to know I missed three but also amazed this means I explored almost all of it. By the way, if you just drop from the Star Destroyer, I think you hit an overspeed warning because the screen goes black and nothing else happens (that or you die cause you fell from a really high height). Just quit fallout 4, playing this comic instead now. The perfect cure for hoverboardom! Oh, I just found the map. Surprisingly I almost saw everything- I went to the top right and came back from the bottom. The only thing I missed was the secret one down underground. Last edited by Dr What on Wed Nov 25, 2015 5:51 am UTC, edited 1 time in total. If by "Apple approved rendering engine on your device," you mean Safari on iOS, it does seem to work there. I got around quite a bit on my iPhone... But I gave up trying to figure out where to tap in order to steer hover board guy. 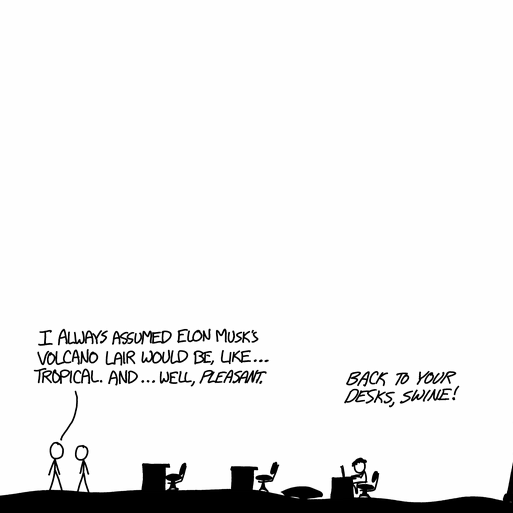 I usually check xkcd late at night before I go to sleep. Not a good time of day for figuring out a potentially addictive game.